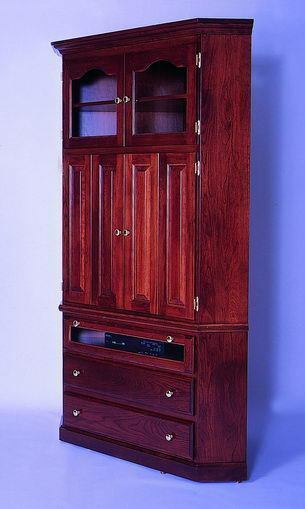 There is room for an entertainment center in your living room or den! The Amish Legacy Corner Entertainment Center is Amish made to fit a corner beautifully and you can trust that it will leave its mark of excellence forever. The Legacy features top cabinets with curved wood accenting them nicely, raised panel center doors that open to your television display and lower drawers that are ready to store. There are plenty of custom features built into the Legacy that make it a joy to use for years to come! There's adjustable shelving and a smooth pull-out swivel tray along with gorgeous crown molding, interior lighting and soft closing doors. Measures 84 3/4" high, 27 1/2" deep with a wall space of 37 1/2" and a TV opening of 35"
The benefit of shopping Amish furniture (in addition to the quality construction, stunning styles and features) are the custom options. We invite you to connect with an Amish Furniture Specialist if there's something you need to customize. They can talk dimensions and drawer additions, wood stains and what will work best. We thank you for shopping DutchCrafters for your new living room furniture. Order samples to view at home and have some fun as you pick your new furniture!